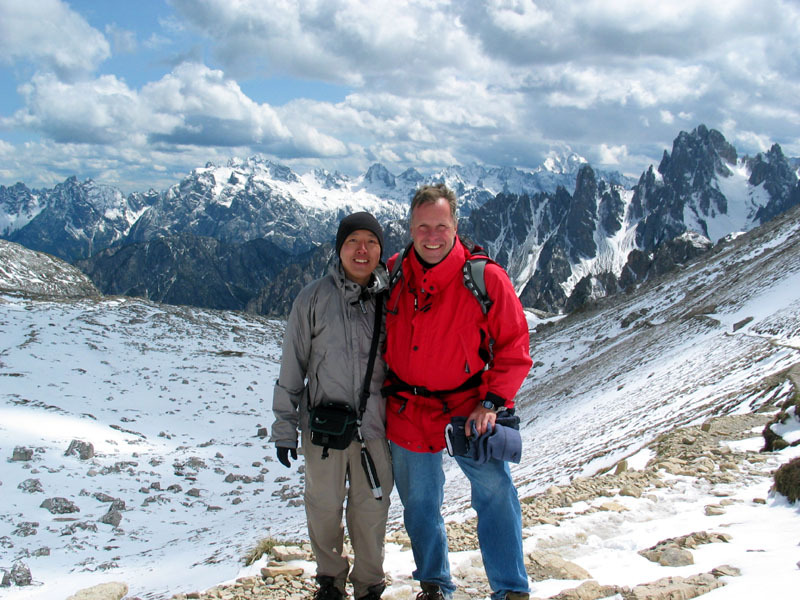 In May, 2003 Wolf and I were in the Dolomites for a little over a week, hiking the Italian Alps. 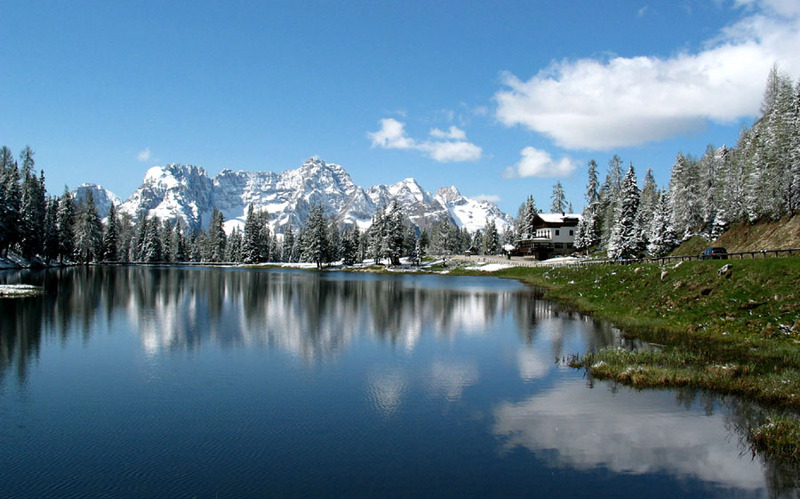 We based ourselves in Cortina d'Ampezzo, a little mountain town about 2 or 3 hours of driving from Innsbruck, Austria. It was low season, and the town was fairly empty for the whole week. 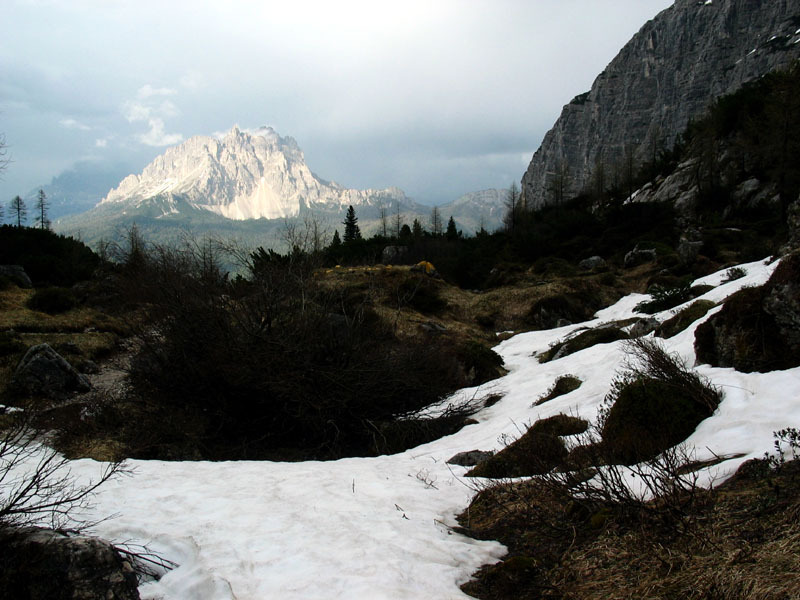 There was still significant snow in the higher altitude, especially after a few days of storm; around Cortina (1225 m), in the green foothills of the surrounding mountains, spring was in full swing. We managed to make seven pretty good dayhikes without a whole lot of planning. 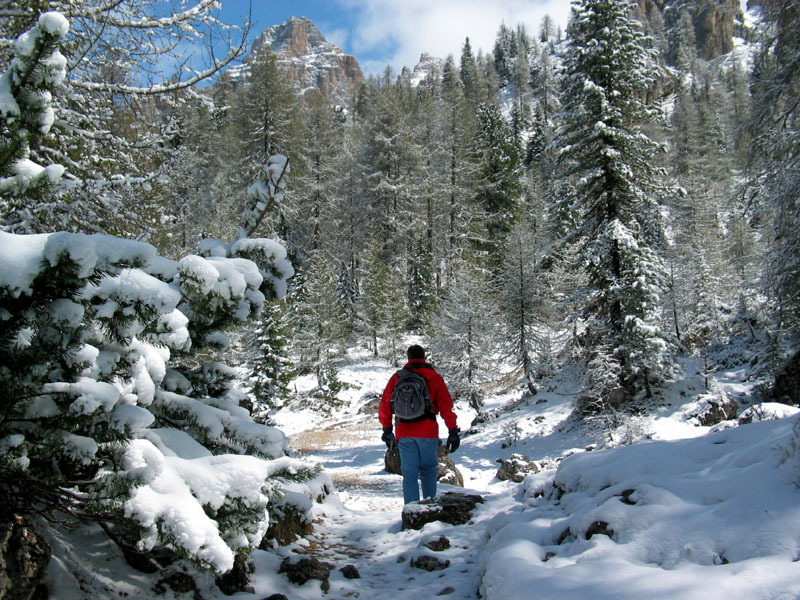 The trails were quiet, and there were days when we did not see another soul on the trail. 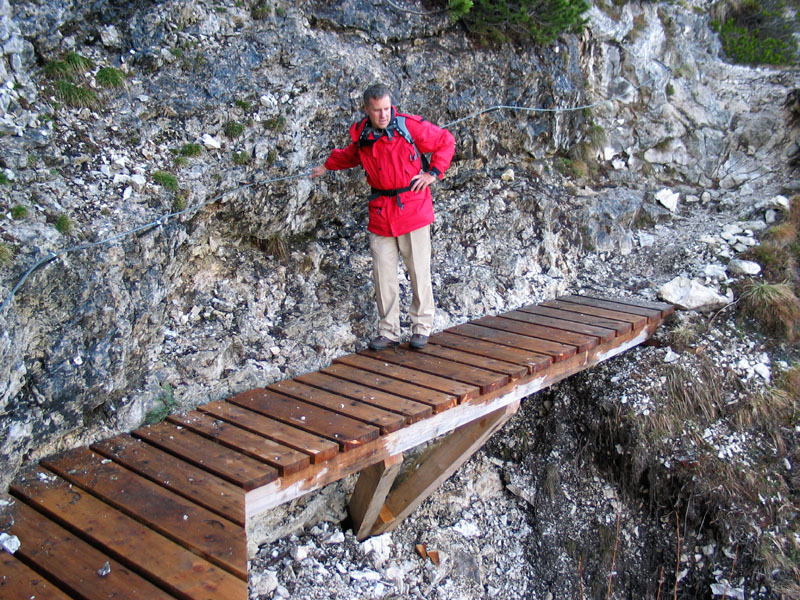 They seemed to be quite steep in general, and I didn't remember the trails in Glacier NP being this grueling. There were usually good trail markings; we only got lost once. The Tabacco topo maps are indispensable, although they're a bit pricey and not tear-proof (we bought them at the local bookstore). 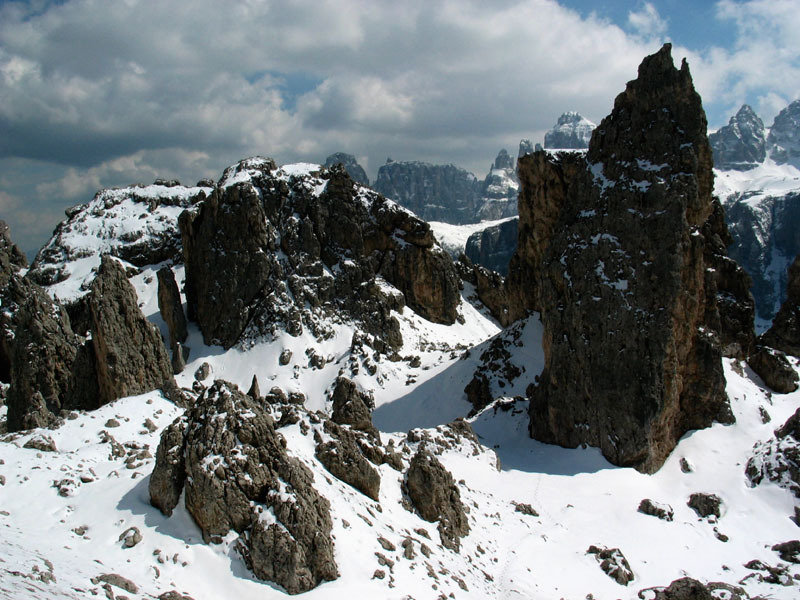 Here is a link to the official homepage of the Dolomites. 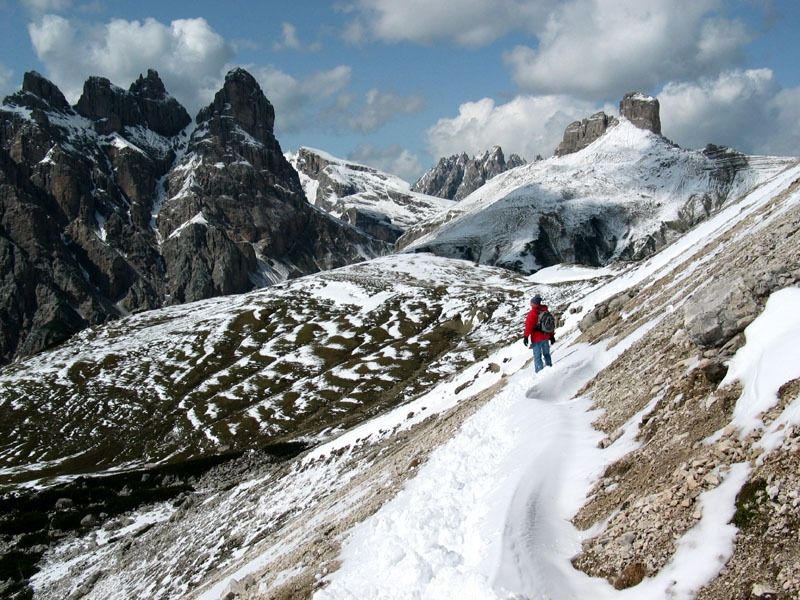 The dolomiti.org site also comtains good information, including an area map. 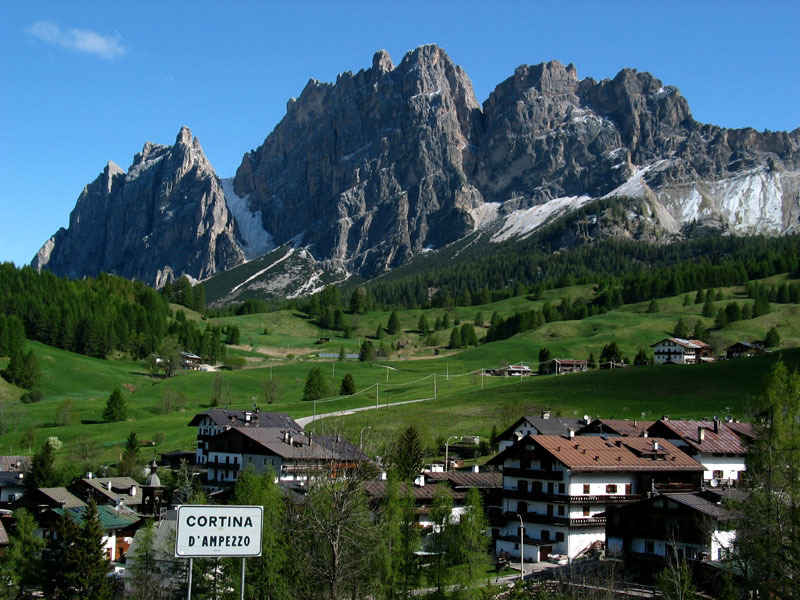 Cortina also has its own homepage. 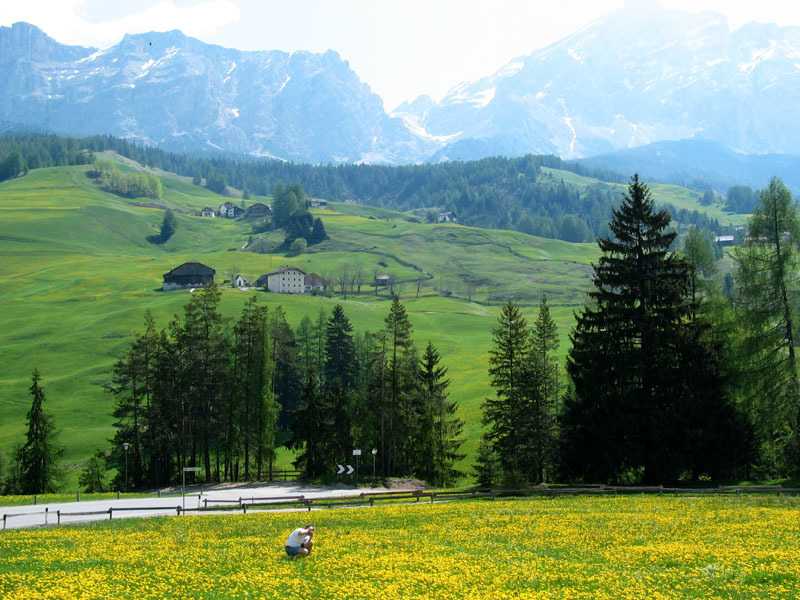 The region (especially toward the west in Alta Badia) is trilingual, with Italian, German, and Ladin. The locales given in the trail maps are often marked in multiple languages, and in the directions below I use the names printed on the maps, sometimes in a different language than the signs on the trail. Autoroute 48 (dir. 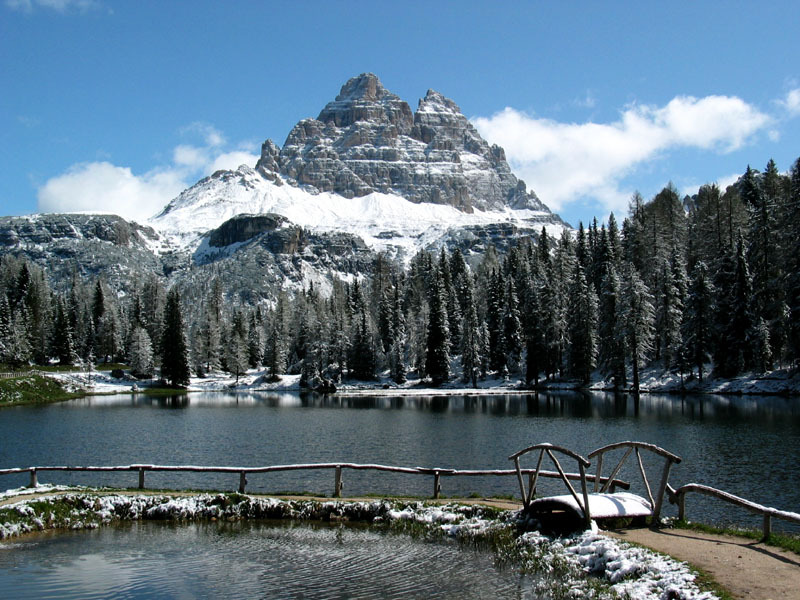 Misurina) to Passo Tre Croci (1805 m); trail #215 goes to Lago di Sorapiss (1923 m). 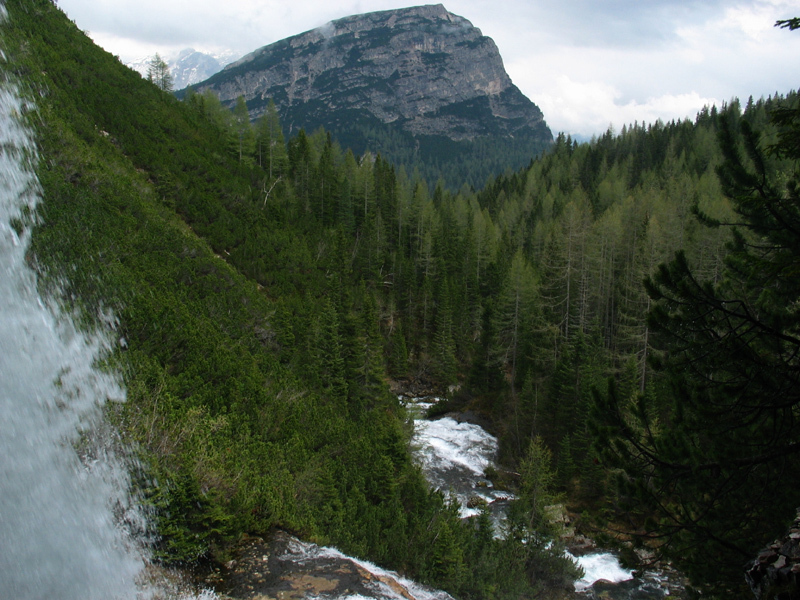 We arrived in Cortina midday on a Sunday, and took a few hours to find a hotel and some food. It was 4pm by the time we started, and the hike was a bit hurried. Parts of the trail came with iron rail, which means that we should have something strapping ourselves to it, but it was pretty manageable without special gears. The lake is of a marvelous milky blue-green color. 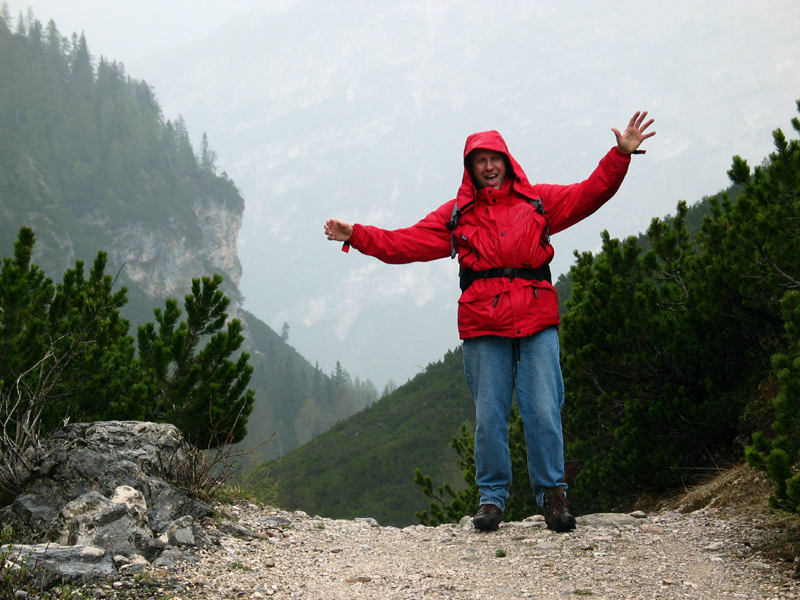 We should have stayed longer, but the lateness in the day and a light rain kept us on the go. From Cortina take autoroute 638 (dir. 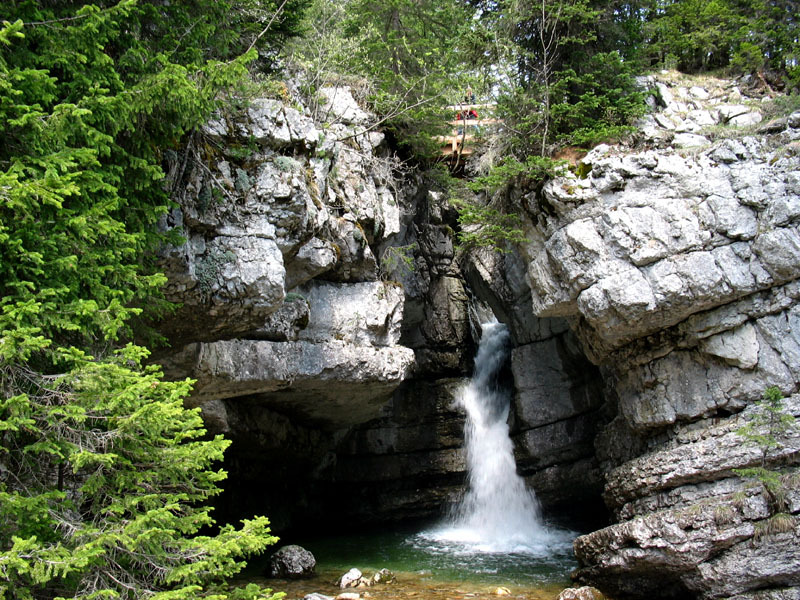 Passo Giau) pass Pocol. Park at the trailhead for trail #430. 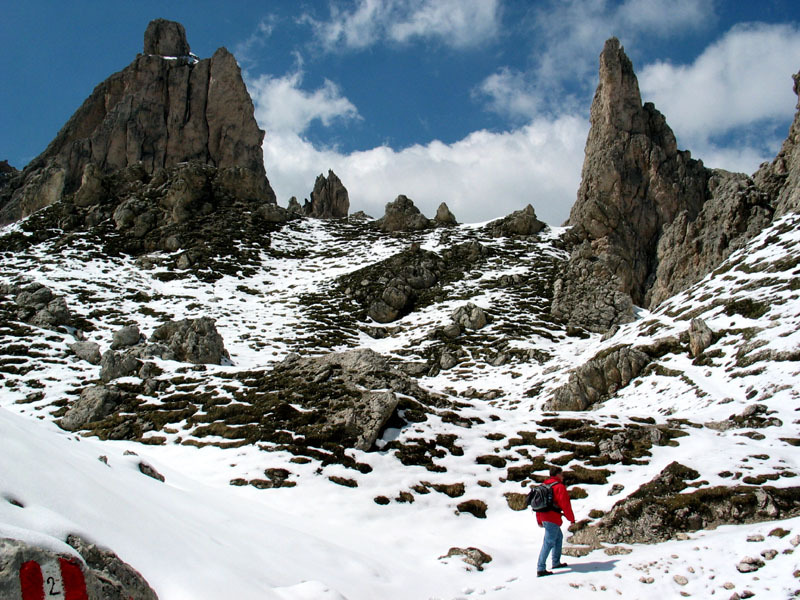 After about 1km, at Lago de Ajal (1412 m), take #431 to Lago Federà (2042 m). Return via #434 and autoroute 638. This is a grueling climb for almost the whole 5 km hike, through fairly dense forests. The cold, muggy weather didn't help. The lake was pretty, and had a few large boulders and an island in it. 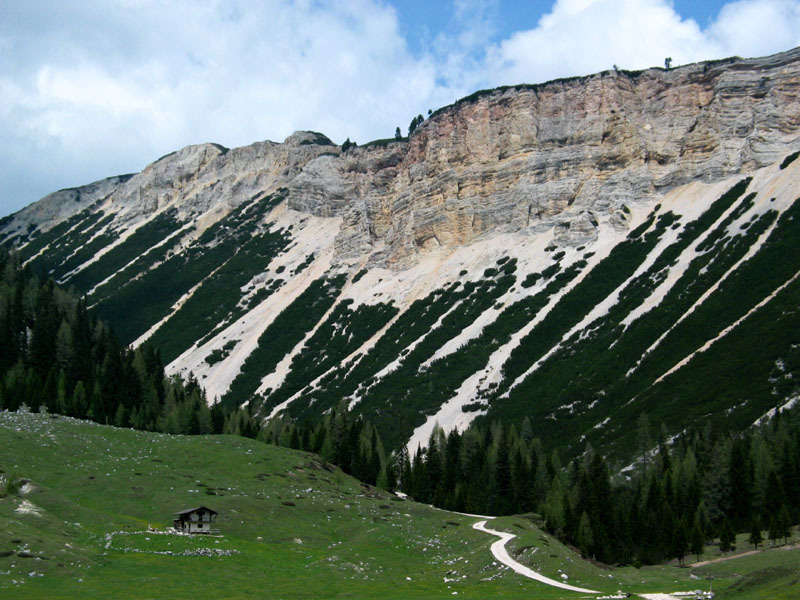 The adjacent alpine meadow would have looked much better with healthier grass in a month or two. 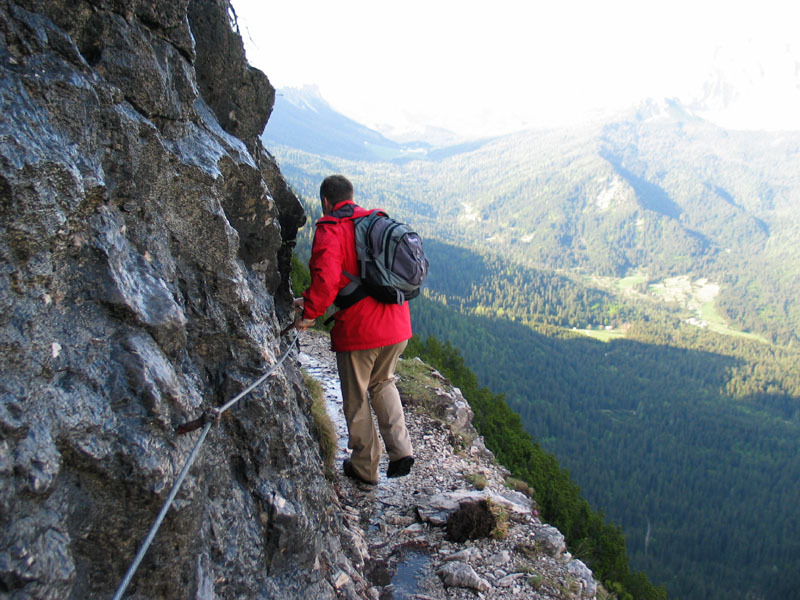 On the way back we found a side trail that leads to a sheer cliff with a few hundred meters drop, overlooking Cortina. 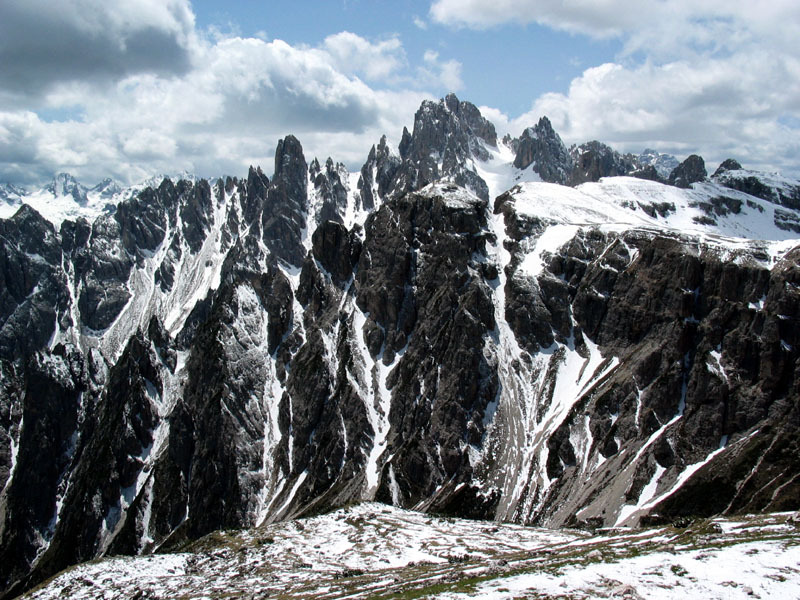 After we left the trail we drove to Passo Giau (2236 m) to get a grand view of the mountains basking in dusk light. 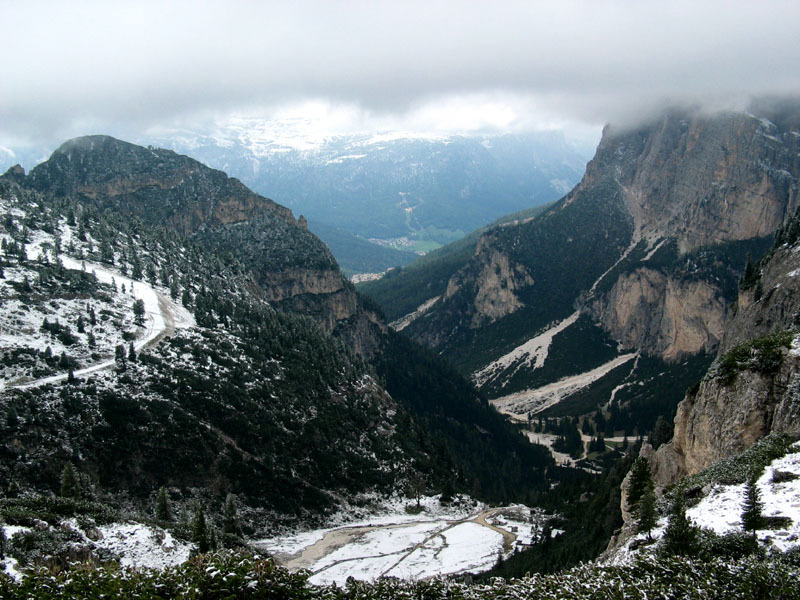 From Cortina take autoroute 51, pass Fiàmes. 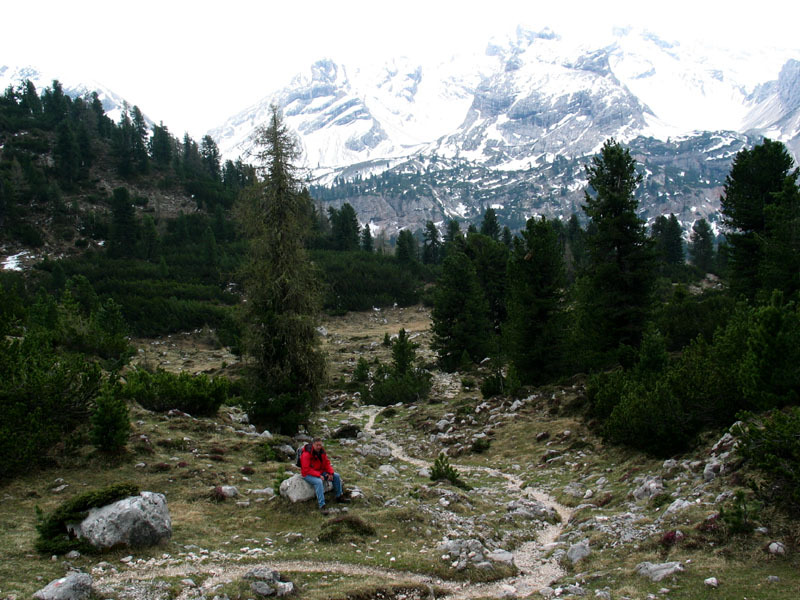 Park near Castel S. Uberto (1449 m), which is trailhead for #10/401 or #6. Take #10/401, which becomes a wide mountain bike trail. 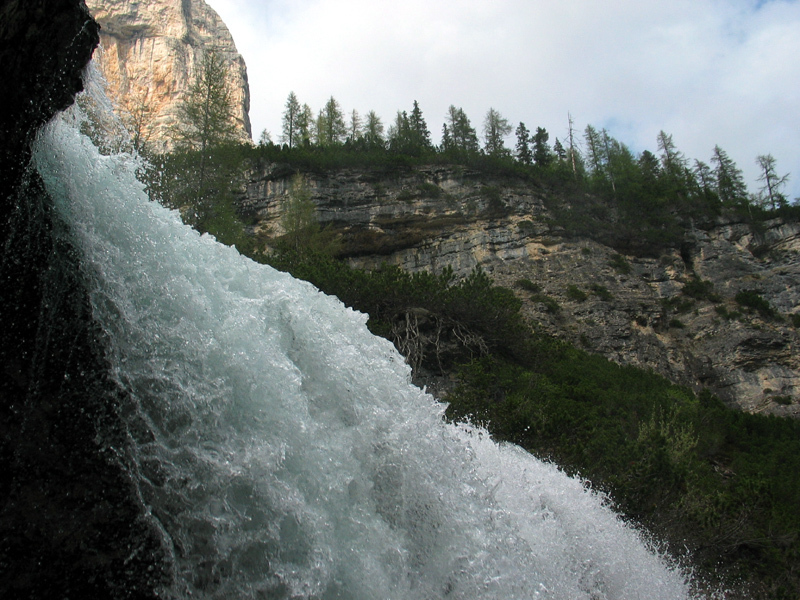 There are two small loops for the water falls. Turn back near border between Parco Naturale delle Dolomiti d'Ampezzo and Parco Naturale Fànes-Sènnes-Bràies (1839 m), just a little bit beyond Lago di Fànes. We didn't do the waterfall loops because the trails go behind the waterfalls and just did not look safe without being securely attached to the iron railing. 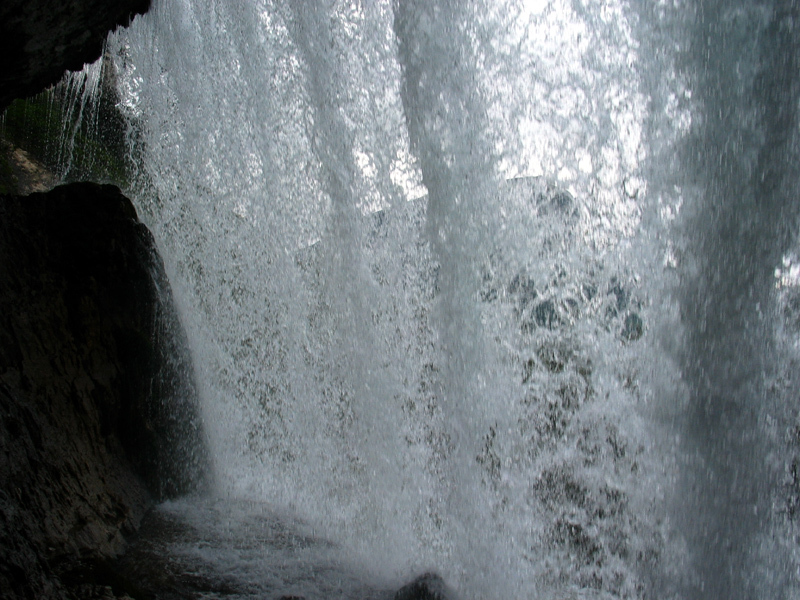 I did manage to get partially behind the second waterfall; it was neat to hear the sound of a waterfall "from behind." 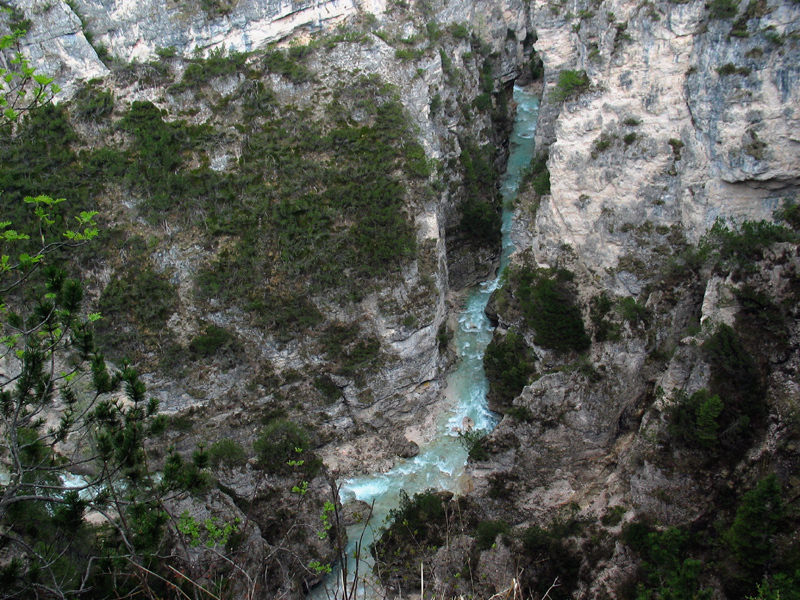 Rü de Fànes carves out a deep gorge near the trailhead, but around the parks' border it is a series of tranquil ponds. Take route 48 dir. 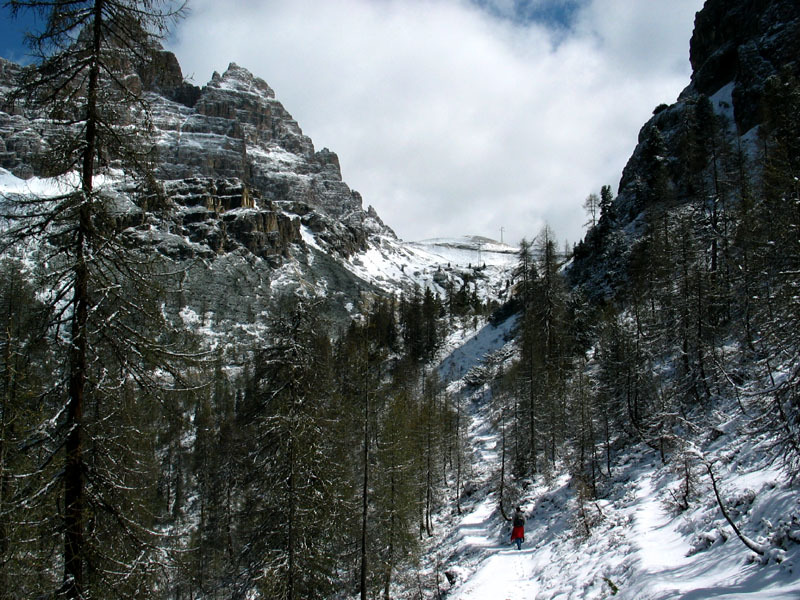 Passo Falzarego; at the pass take the right branch, dir. 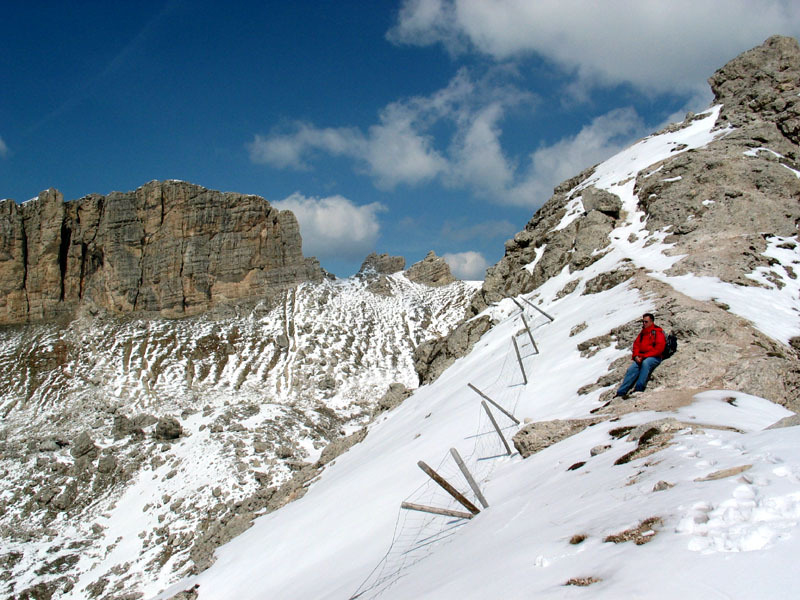 Passo di Valparola. Pass Passo di Valparola. 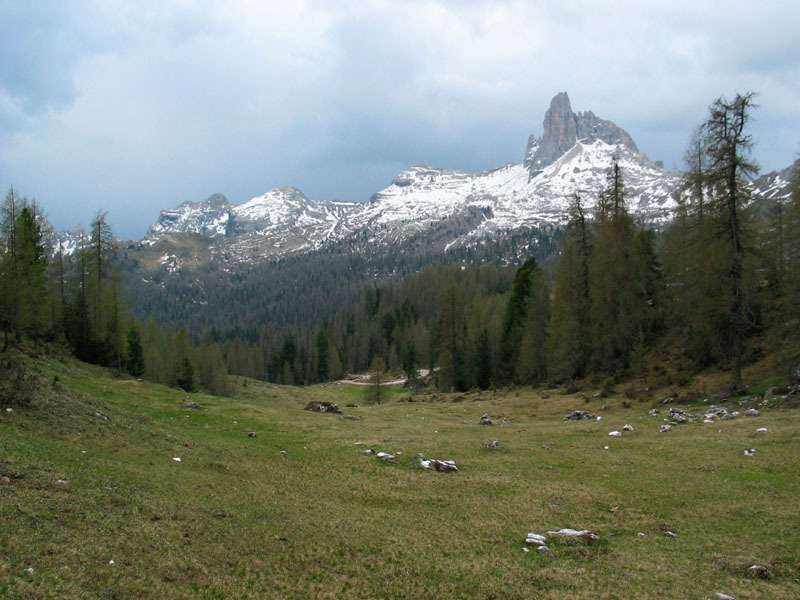 Right after Camping Sass Dlacia turn right toward Capanna Alpina (1720 m). 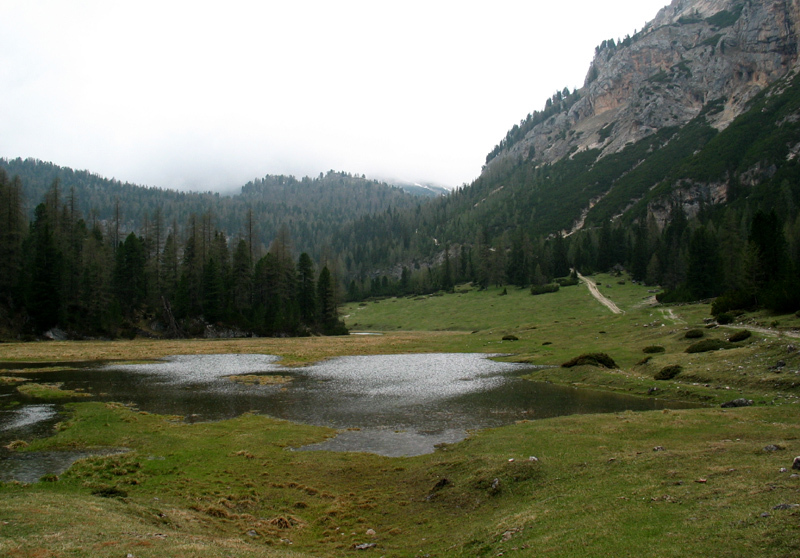 This is trailhead for #20, which leads to the lake (2182 m). There was a fresh coat of snow at the passes, and it was threatening to rain/snow all day. 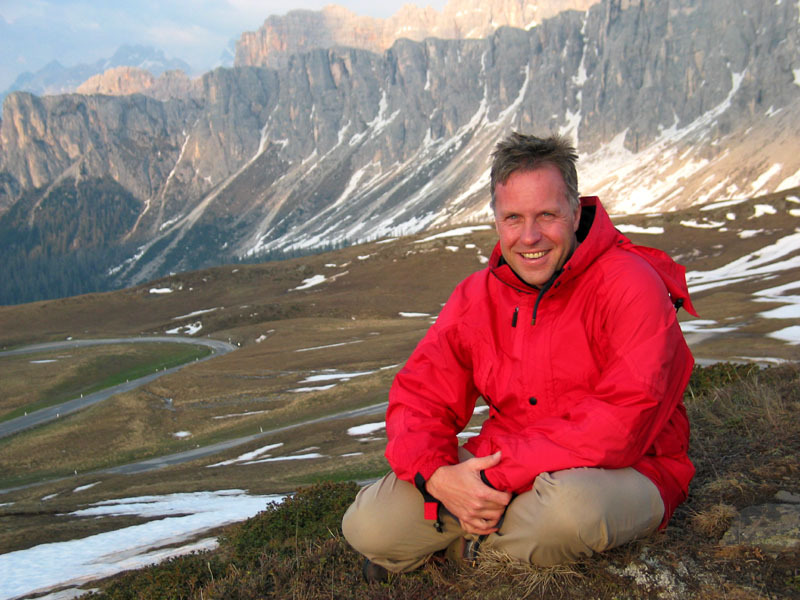 Temperature at the passes: -1.5° Celsius. 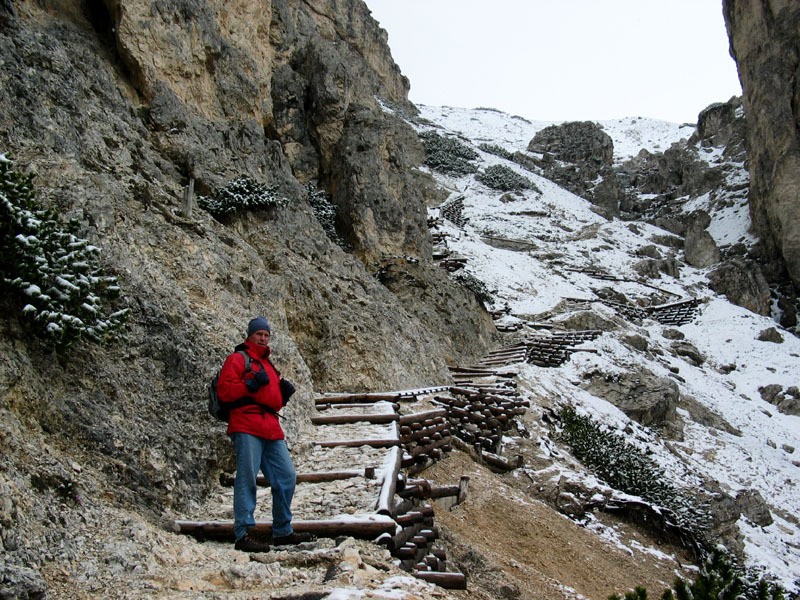 The trail got quite steep and snowy in the last portion, but it was still passable. 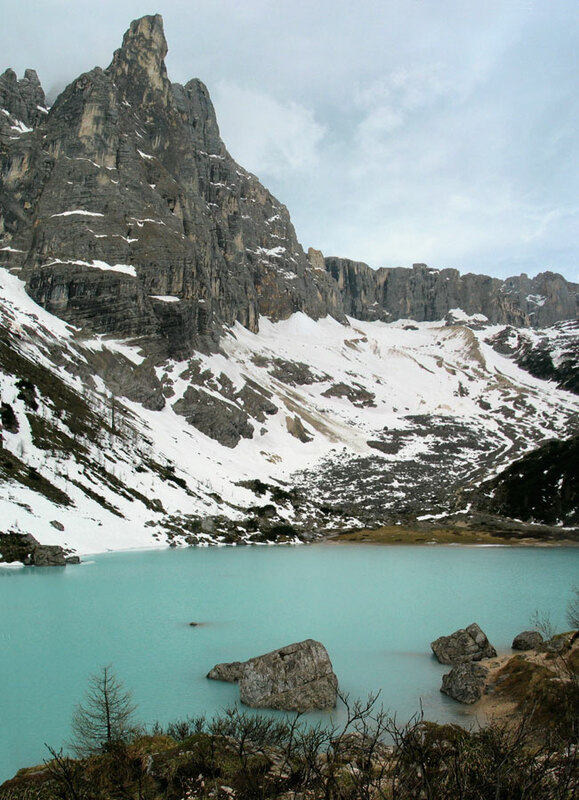 The deep blue lake was nicely camouflaged in the winter scenary; we didn't see it until we climbed higher up. 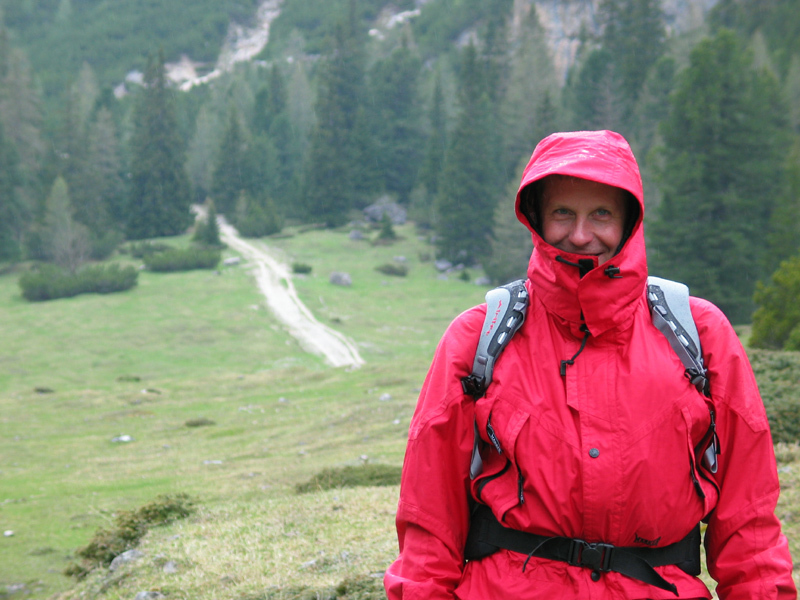 After a short lunch we started to move because of the cold and the threatening low cloud. The snow and fog became heavy just in time for our descent back to the trailhead. 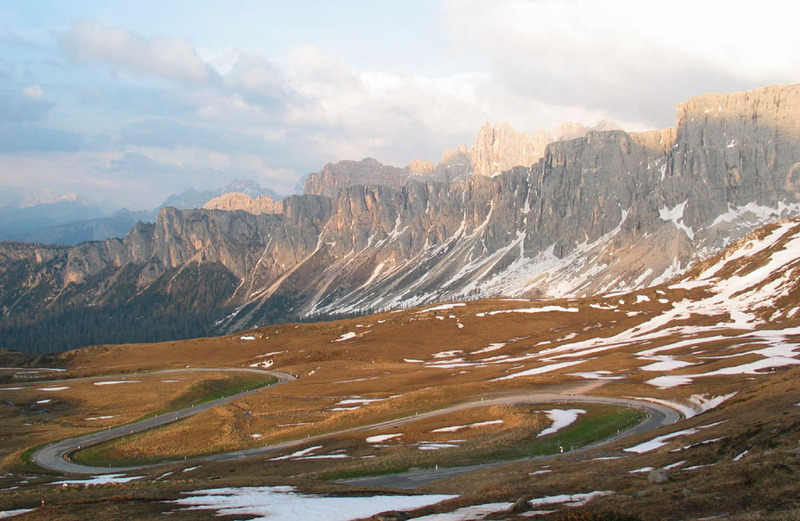 Route 48 becomes 48b a few km after Passo Tre Croci. 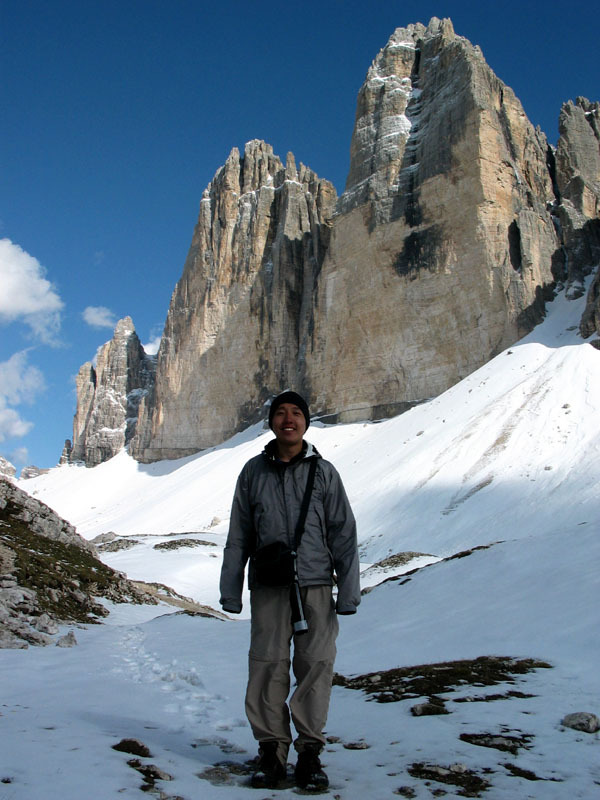 Soon after Misurina follow sign to Tre Cime. 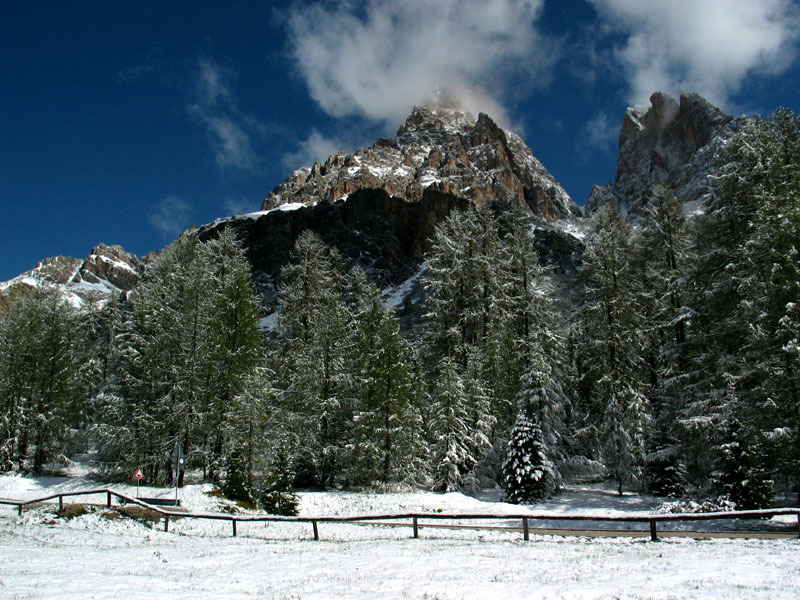 Park near Pedaggio Maut (toll booth; closed at the time of our hike). 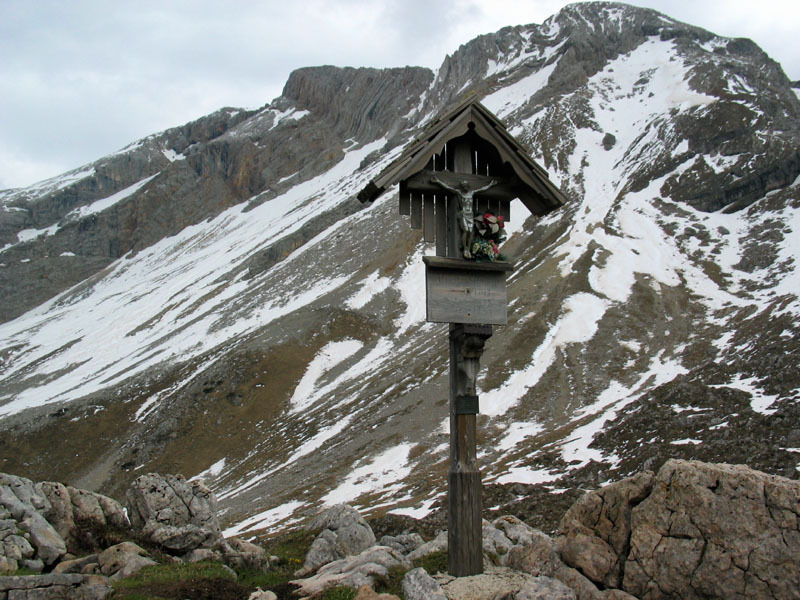 Take trail #101 (trailhead 1851 m) all the way to Rifugio Auronzo (2320 m). 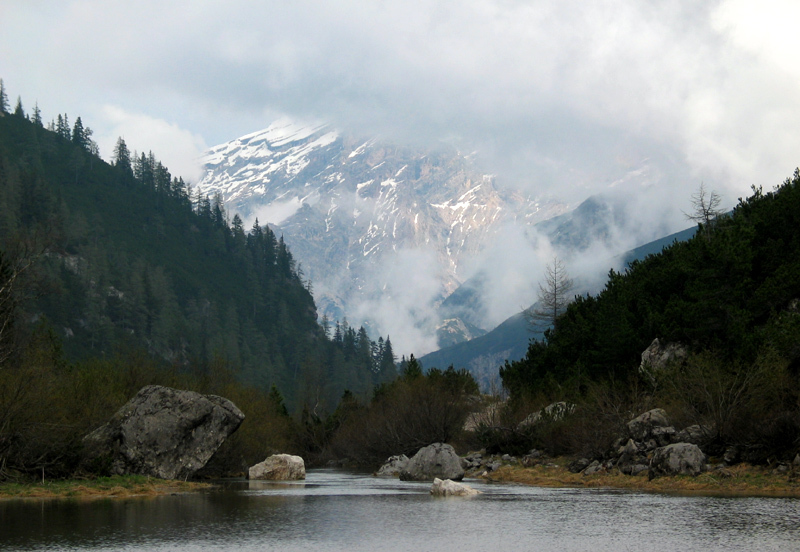 Continue on #101 until Paternsattle (2454 m); turn back toward the rifugio. 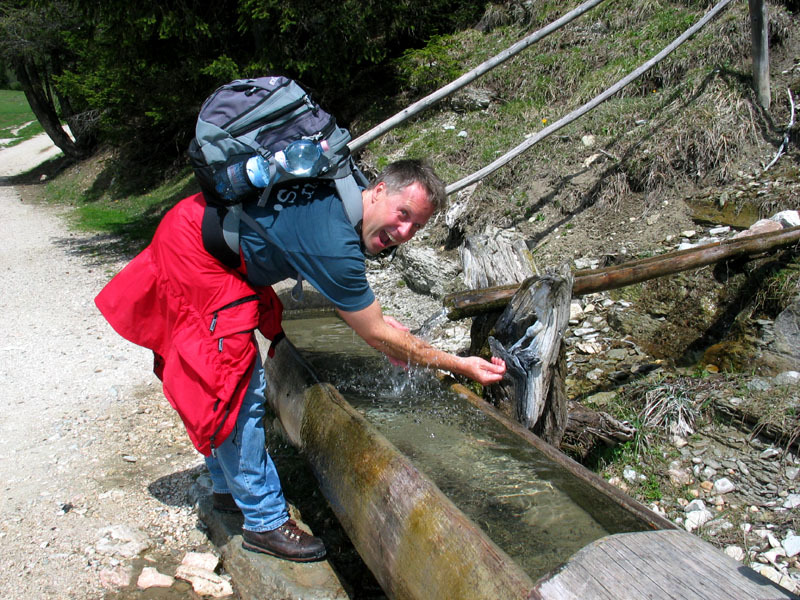 Continue on #105 until the lakes (2245 m). 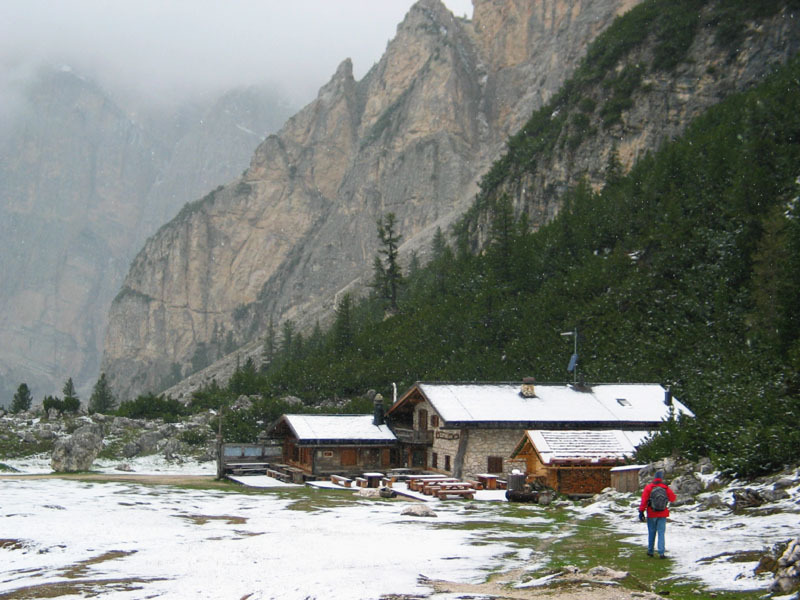 Then back to Maut via the rifugio and the main toll road. This is the first day without precipitation--bright and sunny all day long. 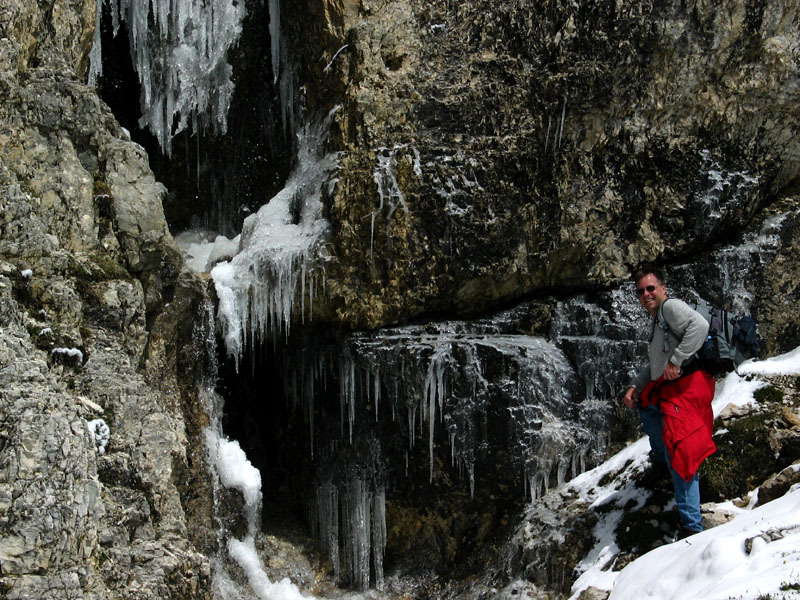 There was quite a bit snow on parts of the trail, sometimes thigh deep. 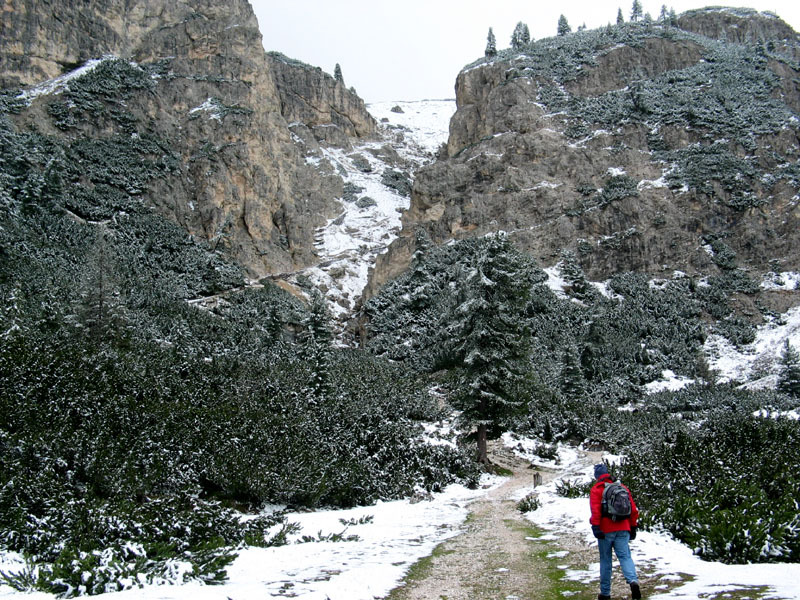 The fresh snow at the Paternsattle prevented us from doing a loop around the base of Tre Cime, which explains the weird itinerary above. 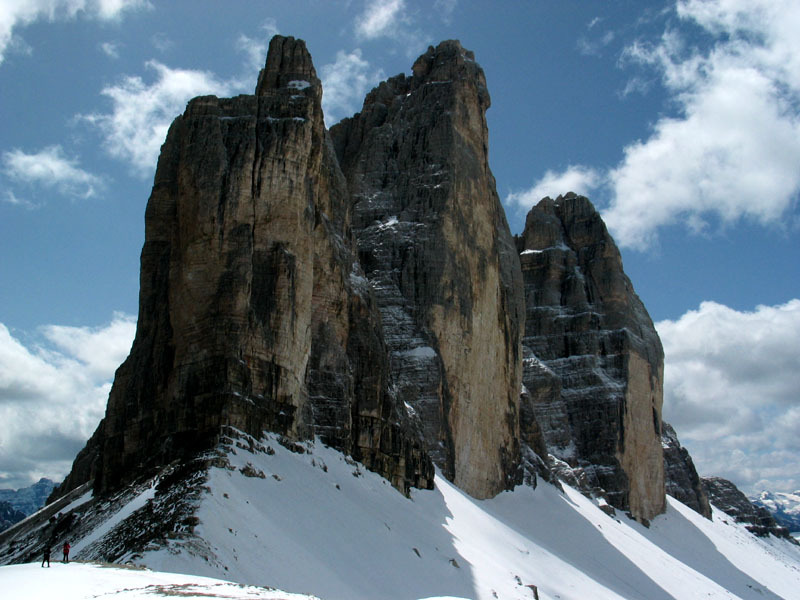 According to the tourist information the Tre Cime is one of the most famous symbols of the Dolomites, if not the whole Alps. There are actually more than 3 peaks, but from the north one can only see the 3 tallest ones. 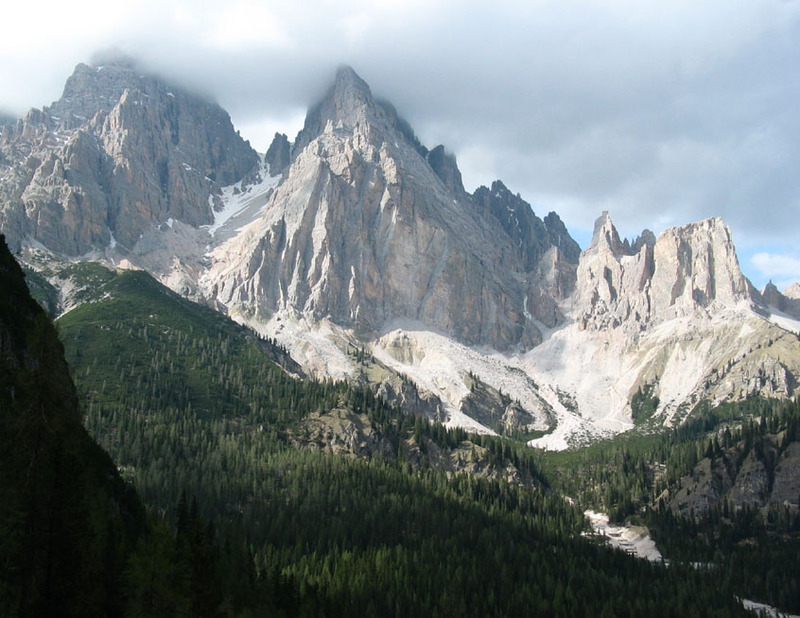 All around the peaks there are other mountain ranges, looming with fantastic jagged peaks. 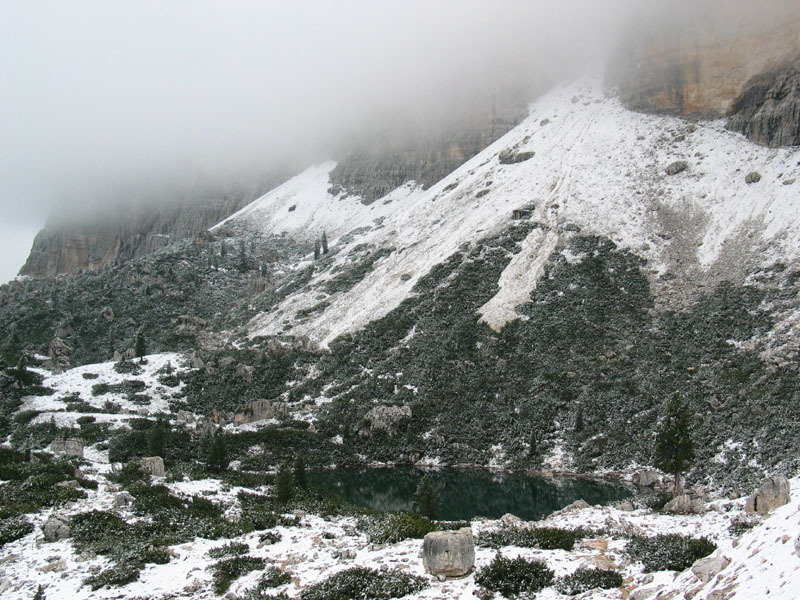 We turned back at the small lakes in the foothills of the Tre Cime, still frozen at the time. 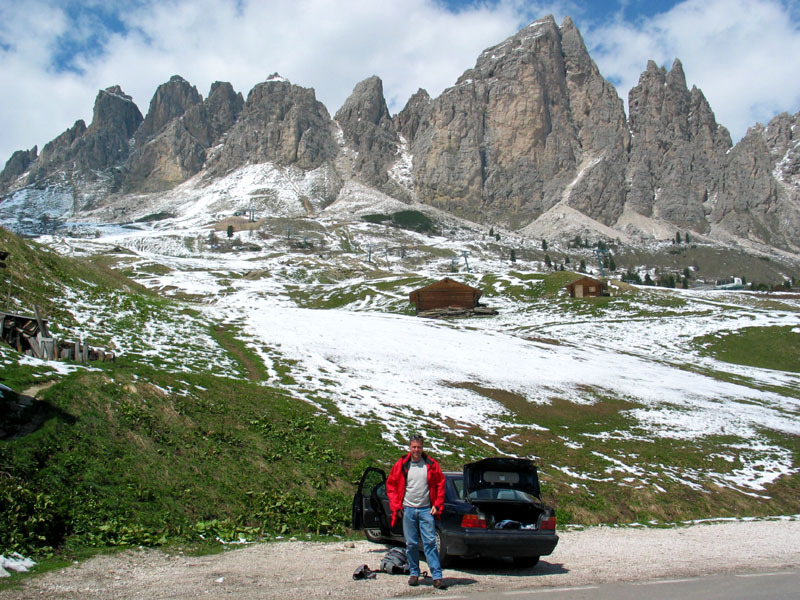 Drive west for a long time, passing Corvara and Colfosco. 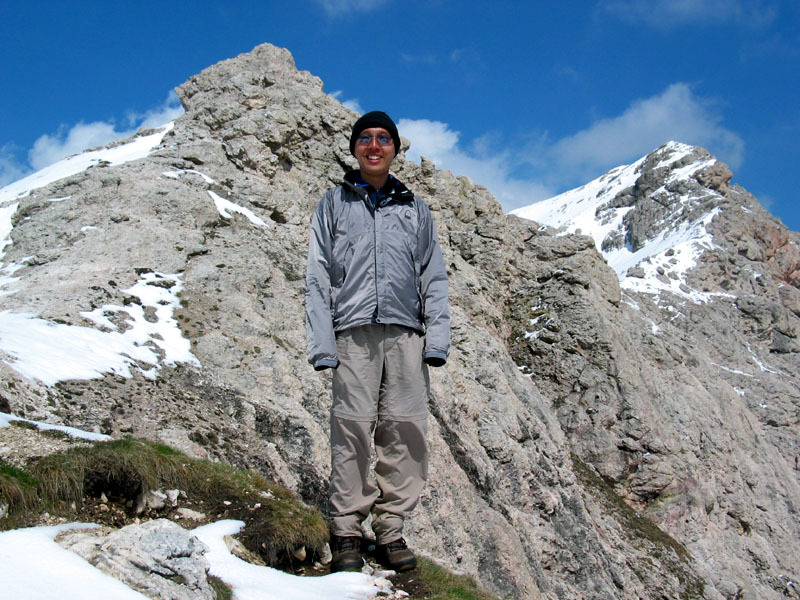 Near hotel Cir is the trailhead for #2 (2121 m). Turn back near Forcella Cier Danter les Pizes (2469 m). 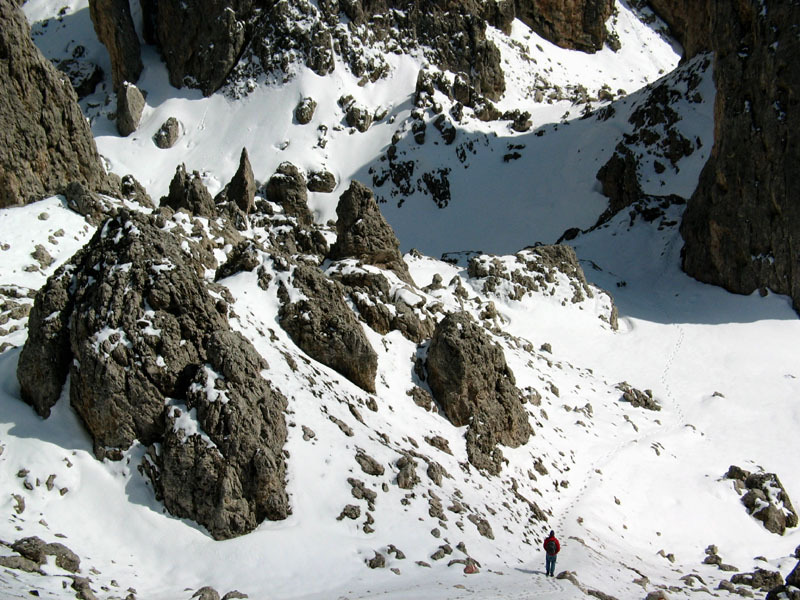 Again snow prevented us from reaching our goal, which is Lech de Crespëina. 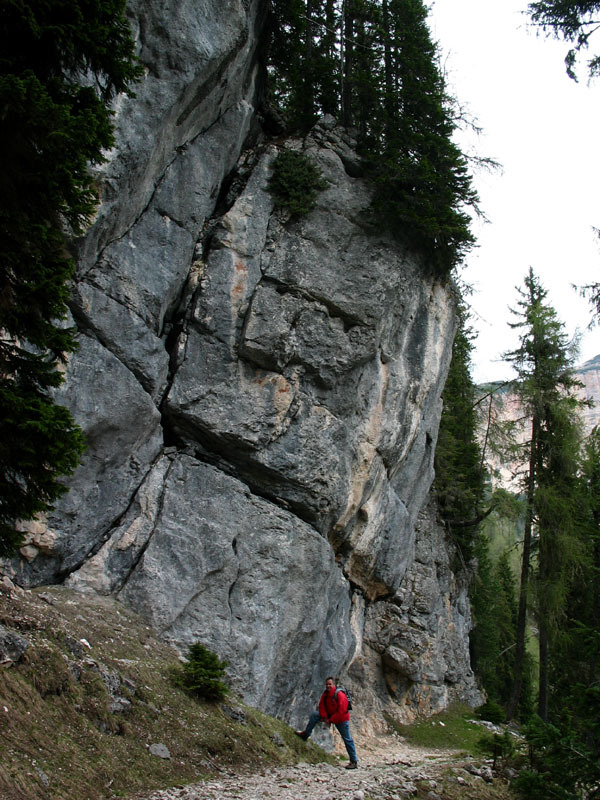 We got to walk through pillars of jagged rocks though, and the view at the forcella was magnificant. 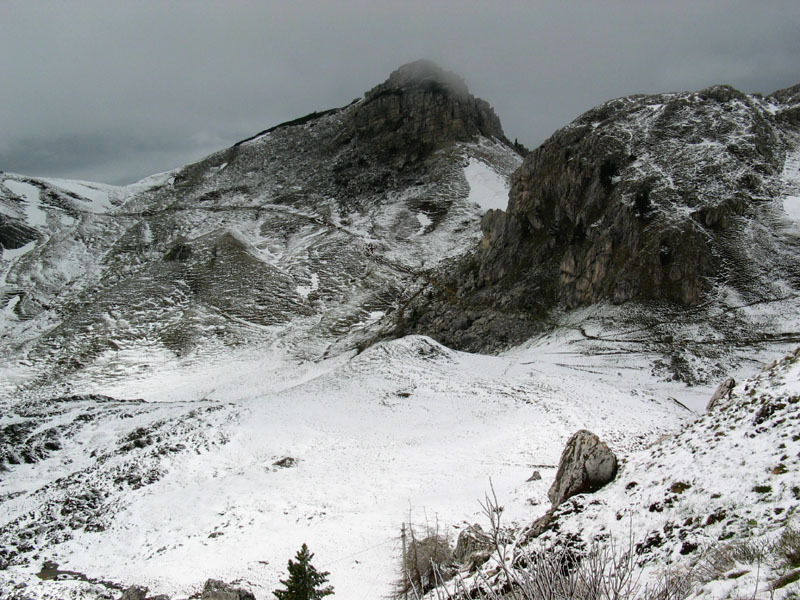 Park near Castel S. Uberto (1449 m) as in Day 3. 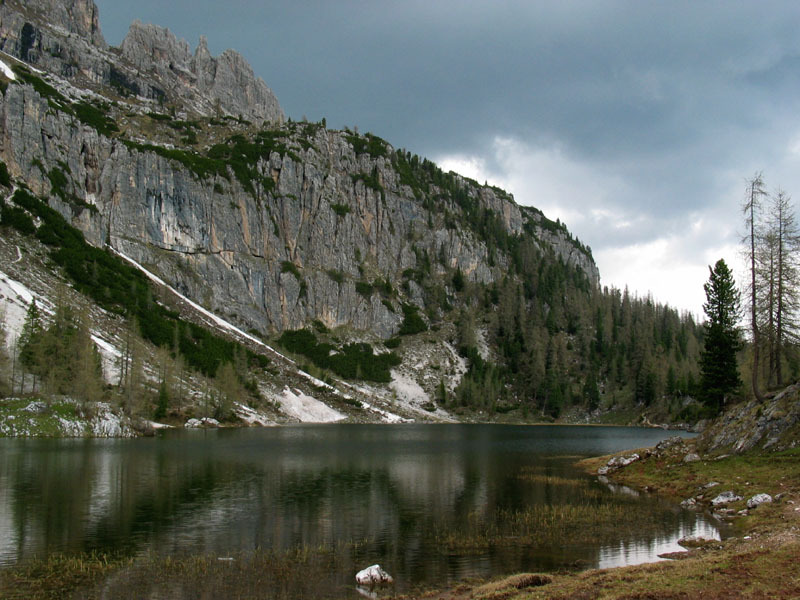 Take #6, pass Ra Stua, to #26, which passes the lakes (2142 m). 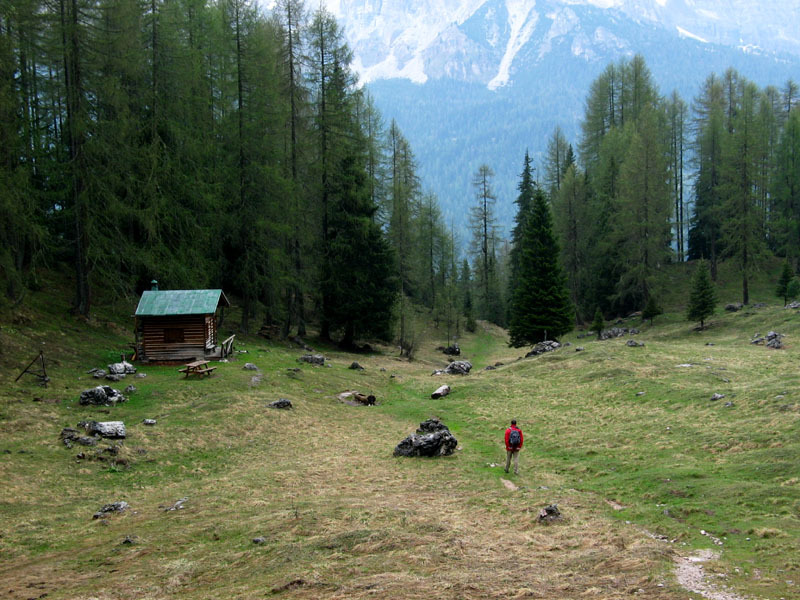 Get back on #6 toward Rifugio Sennes, next to Lago di Sennes. 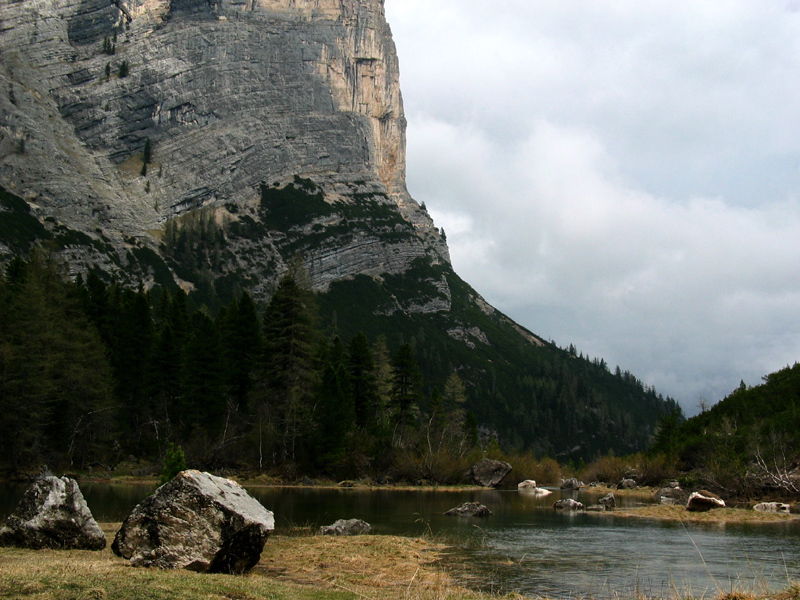 Take #7 south to Fodara, then go east on #9, passing Lago de Rudo. #9 joins back to #6 near the #26 trailhead. 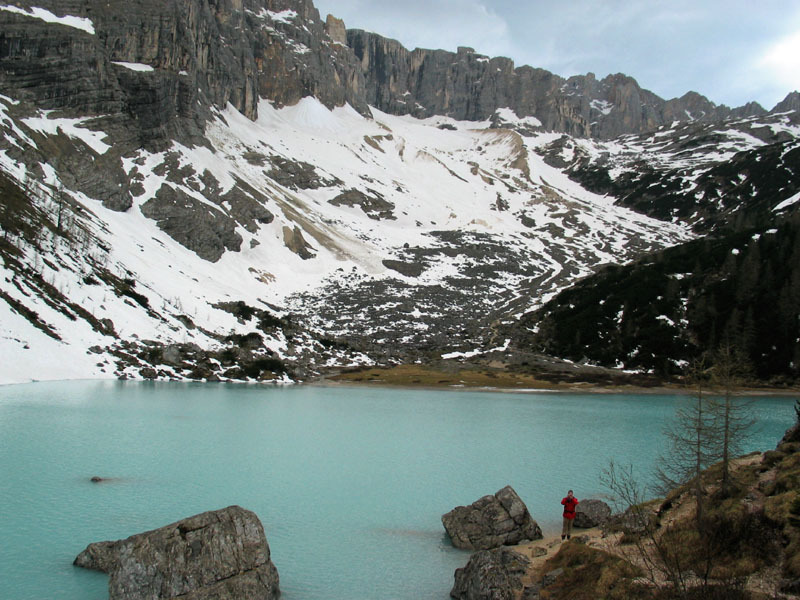 The water level of the lakes seemed too low in general; Lago di Sennes was almost dried up. 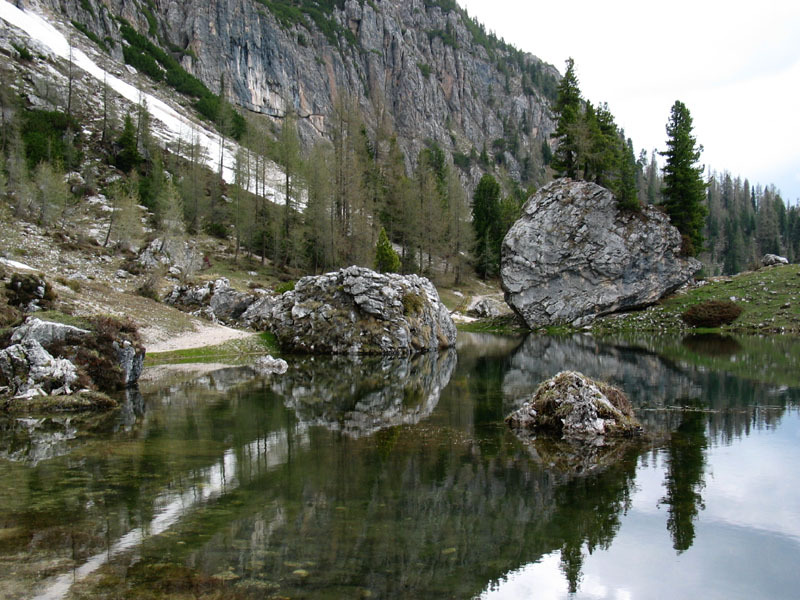 The terrain widely varies, from the open alpine meadows near Ra Stua to barren rocks near the Lakes of Foses. We got lost trying to take the short cut between #26 and #6, but eventually found our way back. A few unidentified small waterfalls on #6 were pleasant surprises. 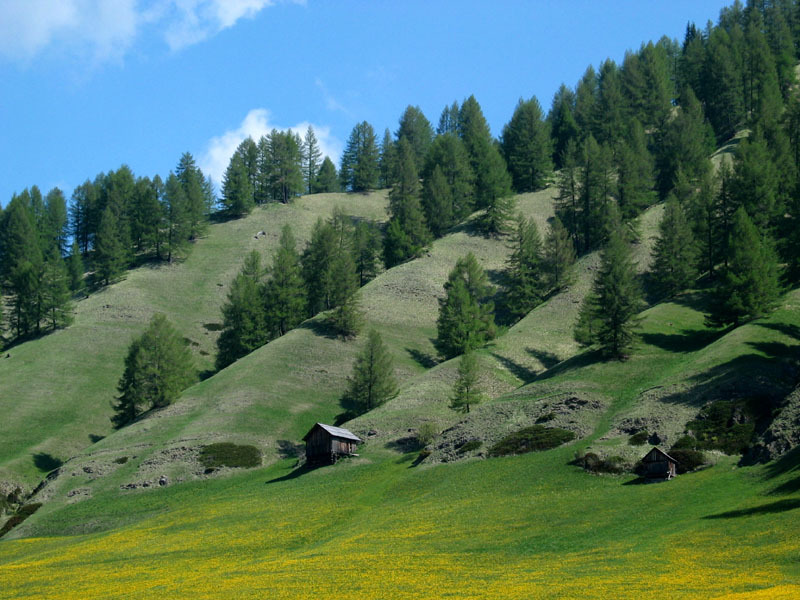 We left Cortina via the Alta Badia region, passing through a few nice meadows. 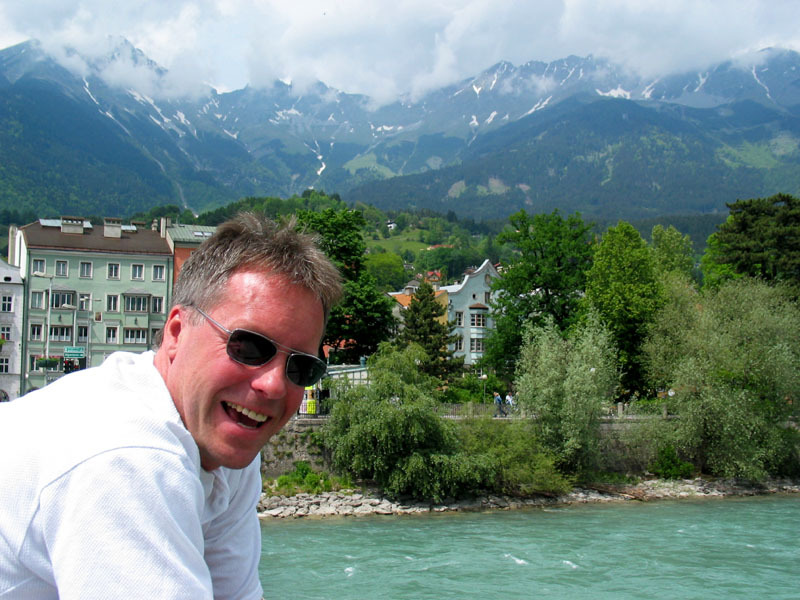 We had lunch in Innsbruck, did some drive-by sightseeing in Bavaria, and arrived in Stuttgart late afternoon.